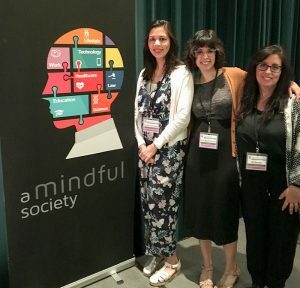 Several members of the Toronto Shambhala community participated as speakers at the 4th annual A Mindful Society conference this past May. The conference connects professionals in education, healthcare, law, technology, workplace and life with leading thinkers, current research and mindfulness-based programs. It was a rich gathering of several hundred mindfulness practitioners interested in learning on topics ranging from building intentional mindfulness communities to mindful eating all under the umbrella theme of Curiosity to Compassion. We had the good fortune of helping to offer a break-out session, led by Shastri Jil Amadio, and supported by myself and Erin MacPherson. Our session was entitled Humanity Meditation and involved a feeling-based exploration of our shared humanity. The practice Shastri Amadio led provided a way to connect directly with the vulnerability, dignity and strength of being human. By the time the session began, our break-out room had filled with those curious to understand more about this practice and how it could uplift not only the individual but human society as well. After a discussion of our basic nature, the need to examine our beliefs and assumptions about humanity, and some examples of how this practice has helped gang members and people with cancer, we were guided in the practice of humanity meditation. Several people commented on the simplicity, depth, and surprising intensity of the practice. Following the meditation we transitioned into a dyad on how connecting with the felt sense of being human can lead to the betterment of society. The discussion unfolded with ease and great liveliness as people shared with unguardedness as if they were old friends. It became evident that the potentially daunting task of “creating a good society” was surprisingly in reach when experienced as the power of two people in touch with their basic humanity simply having a conversation.